"some contemporary writers on vocation ... might lead us to understand it as an issue only for the privileged elite. After all, most people in the world even today quite clearly do not enjoy the luxury of contemplating which career path might fulfill their deep gladness. Instead, they desperately hope for whatever menial job that might come available as a means to put bread on the table. 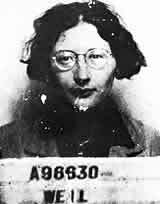 And later in this paper we shall look at how [Simone Weil's] unique vision of the mystique of labor seeks to suffuse all levels of work -- from manual labor to corporate management -- with meaning and fulfillment."